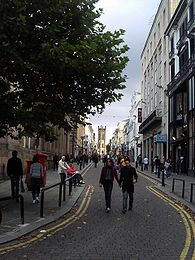 Bold Street is a street in Liverpool, England. It is known for its cafés and for the Church of St Luke, which is situated at the top end. The bottom end leads into the area surrounding Clayton Square, which is part of the main retail district of central Liverpool. The bottom end contains more shops which are chain stores. Liverpool Central, one of Liverpool's main stations after Liverpool Lime Street, can also be accessed via an entrance on Bold Street next to The Lyceum, a post office which was Europe's first lending library. The middle area contains bars as it leads towards Concert Square, a square containing clubs and bars, and the top end contains more independent shops and cafes. For the most part, Bold Street is pedestrianised and cars do not have access.